When there’s no time to waste the SAE 7-Pole Plug Tester provides a fast, easy way to isolate lighting problems to the tractor or trailer. Use it to test the output of SAE 7-pole tractor light cords, while connected to the tractor or to your Square Wheel Industries Trailer tester. 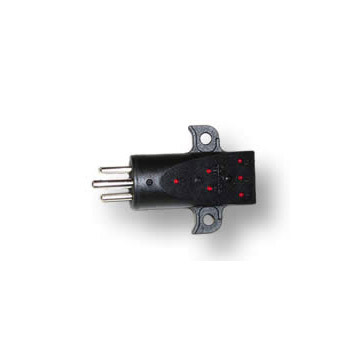 LED Indicators quickly identify complete circuits by glowing red. No light means a problem circuit. Constructed of molded PVC for impact resistance. Use with adapter #01030 to test continuity of light cords.